How to generate Form 16 Part-B on ClearTDS using Excel Sheet. ClearTDS is Cloud based software to quickly prepare TDS returns and Form 16 using an easy Excel-like Interface. It requires no software installation, allows you to access data from anywhere, anytime and also import data from excel sheets. 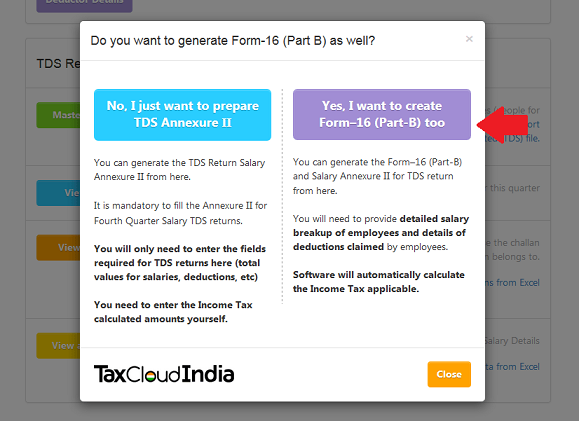 Along with the Salary Annexure of TDS return you can also generate Form 16 (Part B) for your employees. 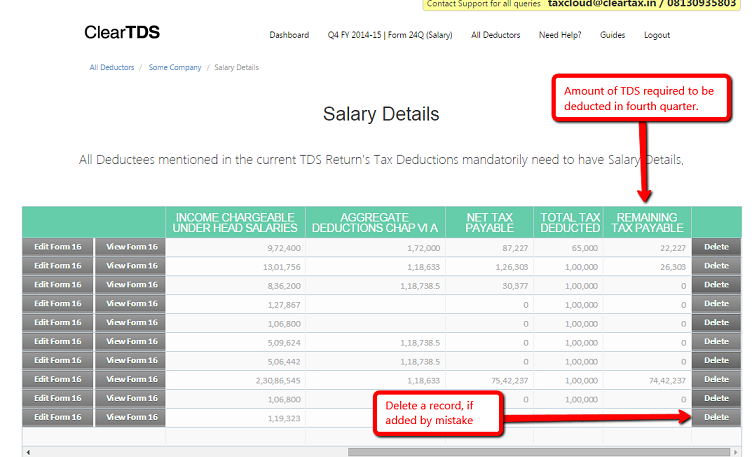 ClearTDS also helps you adjust TDS for fourth quarter by automatically calculating remaining income tax due to be deducted in the last quarter. Go to cleartds.com website and login with your TaxCloud account. Read our getting started guide to get familiar with ClearTDS software. generate the Form 16 (Part B) all by yourself without any expert help. Choose to work on Form 24Q and fourth quarter. 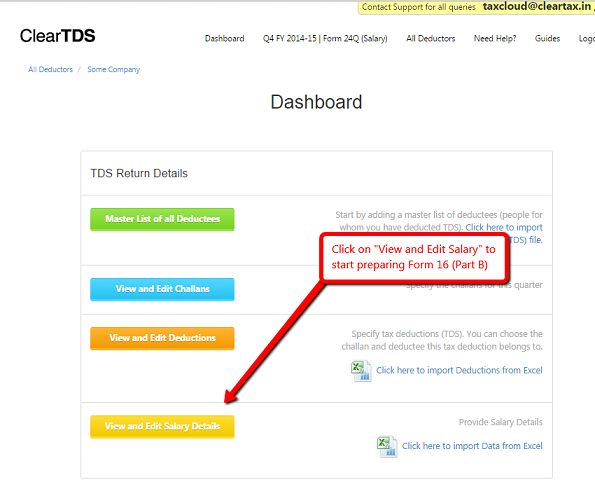 On the Dashboard, click on View and Edit Salary Details in the TDS Return Details panel. You will now be directed to the Salary Details page. Since ClearTDS is completely cloud-based, you can enter data directly on the Excel-style sheet by clicking on an empty tab. All your data is transfered via a bank-grade secure 256 bit SSL network to keep your data safe and protected. You can also import data from Excel Sheets. Just copy all your data in our excel template and upload it. Read our guide how to import data from excel in ClearTDS. You are only required to provide salary bifurcation, Extempted Section 10 Allowances and Deductions claimed by the employee. 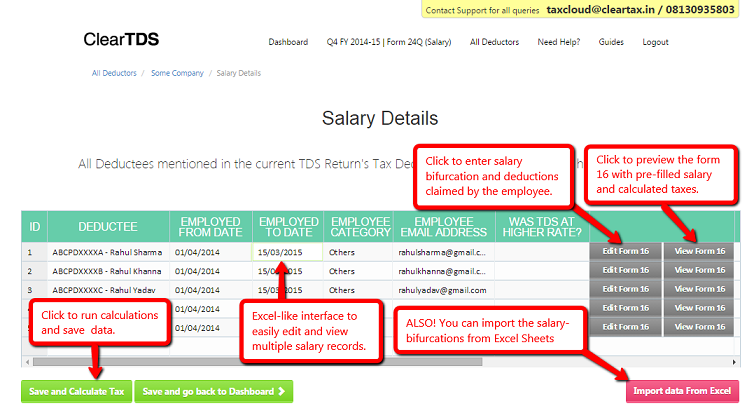 ClearTDS shall automatically calculate the qualified deductions and the income tax due. ClearTDS supports all the deductions under section 80. 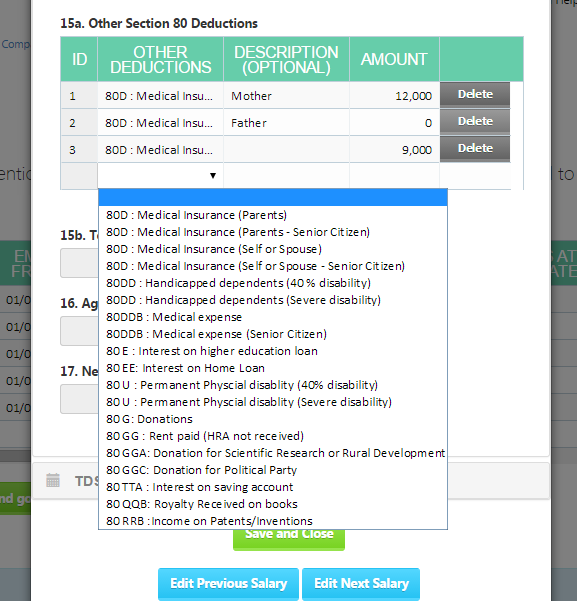 It allows you to add some additional description for each deduction which gets displayed on the Form 16. You entered such list for Section 10 Allowances, Other Income, 80C deductions and other deductions. Step 2.2: Add deductions claimed by employee on the fly. You can preview the form 16 before generating it and check the remaining Tax to paid by employee. You can also adjust your fourth quarter TDS by deducting exactly the same amount of tax as remaining. ClearTDS also provides you the quick sumary of calculated fields for review. 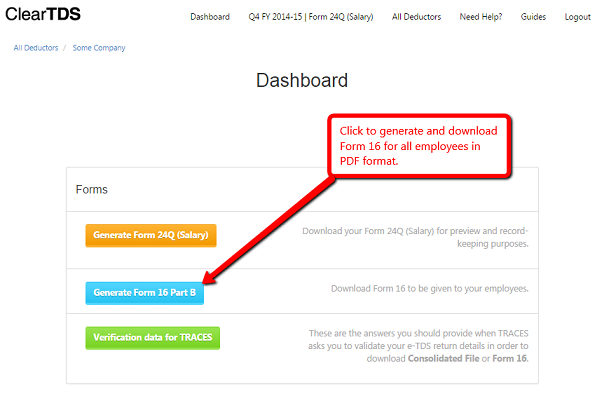 Once all the data is entered and reviewed, you can click on the "Generate Form 16 Part B" button on TDS return Dashboard's Forms panel. A Zip file will be downloaded containing all the Form 16s in PDF format. Click here to download a sample Form 16 PDF. Feel free to contact us at taxcloud@cleartax.in for any query or suggestion. Step 4: Download all Form 16s in PDF format. ClearTax can help your employees E-file I-T returns. Your employees just need to upload this form 16 on www.ClearTax.in and they can E-file their Income Tax Return in 7 minutes. To know more about employee taxation, contact ClearTax Experts at support@cleartax.in.